The review that follows is by Unseen Films writer Ariela Rubin. Ariela is taking the lead on this review because when I found out what this film was about I made an effort to see the film with Ariela because she has met the men and rhinos profiled in the film. Since she is more qualified to discuss the film she is taking the lead on the review. KIFARU is the Swahili word for rhino. This documentary about the last three remaining Northern White Rhinos, was originally called Sudan: The Last Man Standing. This film takes place primarily at Ol Pejeta Conservatory in Kenya, where the last three Northern White Rhinos lived: Sudan, Naji(his daughter), and Fatu(her daughter). 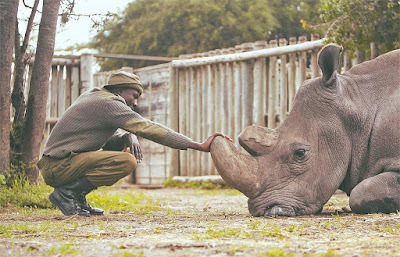 This documentary was one I’ve been awaiting to see, and holds a special place in my heart as I went to Kenya and to Ol Pejeta several years ago, and was inspired to go there to meet Sudan, the last male Northern White Rhino, before it was too late. The film follows the three main caretakers: James, Jojo, and Jacob (I met James when I was there, and he showed us around). These men spend 10 months of the year there, away from their families, to protect the rhinos. You can see that these men are dedicated to taking care of the rhinos, and really get attached to them. They are true heroes. This film is a real look at what extinction looks like. We get to see it first hand through Sudan. It’s heartbreaking. Heartbreaking that humans have done this. I hope everyone sees this documentary, it’s such an important film to see, and make sure you have tissues nearby.